The effects of recent changes in global recycling markets are now being felt locally. End-markets for low-value plastic items are insufficient to handle the amounts generated. Until further notice, plastic containers labeled with a #3, #6, or #7 in the chasing arrows will be landfilled. Fort Collins has a volume-based trash rates system called Pay-As-You-Throw (PAYT) that provides economic incentives for reducing waste. Residents are charged for the amount of trash they generate in the same way we are billed for the amount of electricity, gas and other utilities that we use. That means the less you throw away, the less you pay. Simply sort your recyclable materials based on our Recycling Guidelines poster. All aspects of the PAYT ordinance apply to residents of single-family homes who live in Home Owners Associations as well as those who subscribe directly with the hauler. Be sure to put your materials out by 7 a.m. on your regular trash day. Missed your pick-up? Call your hauler. Only include accepted items in your recycling bin. Including additional materials jeopardizes recycling markets and makes processing more costly. Many items not accepted in curbside recycling can be recycled elsewhere. What should Fort Collins residents do? Residents may choose to throw away the low-value plastics (#3, #6, and #7), or know that if these materials are included in the recycling bin, they will be landfilled until recycling markets improve. Recycling other materials is still encouraged! 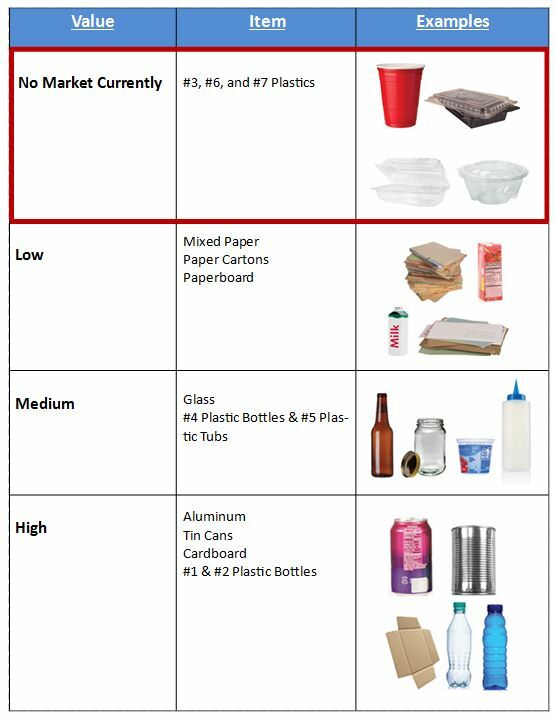 Markets for all other recyclables remain (aluminum cans, steel / tin cans, glass, paper, and plastic bottles / tubs #1, #2, #4 and #5). Keep contaminants out of the recycling bin: plastic bags, needles, food, liquids, paper coffee cups, and other single-use items like plastic utensils, straws, paper plates and napkins. Remember to place recyclables loose in the bin – recyclables in plastic bags won’t be processed. Chose to use reusable containers to help reduce the demand for low-value plastics. What is happening with recycling markets? Times have been turbulent for international recycling markets, with significant changes occurring in end-market destinations for many recyclables. China, which has long accepted significant amounts of recyclables from the United States, has imposed tight restrictions on accepted recyclables, and recently established a complete freeze on their importation. Recycling programs across the United State are being impacted. Domestic end-markets for certain recyclables are insufficient to handle the amounts of recyclables generated. There is oversupply of low-value recyclables with little demand. As a result of China’s freeze on the import of recyclables, Waste Management / Recycle America (who are contracted to operate the Larimer County Recycling Center) cannot currently market the low-value plastics. Thus, until further notice, plastic containers labeled with a #3, #6, or #7 in the chasing arrows will be landfilled. These materials are commonly the most thin/flimsy types of plastics such as party cups and “clamshell” deli boxes. The numbers can be found within the recycling symbol on each container. What is the difference between low-value and high-value recyclables? Yes! Despite fluctuation in global recycling markets, and changes in which commodities are feasible to recycle, the environmental and social benefits of recycling remain. 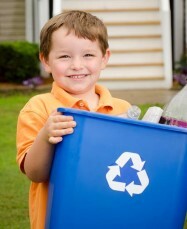 Many recyclables, such as aluminum, cardboard, and #1 & #2 plastic bottles, have strong markets and are still valuable. Recycling those commodities and making them into new items to be used again conserves resources, saves energy, and reduces greenhouse gas emissions. The domestic recycling industry is a significant force in the country’s economy, spurring job creation and economic development. China’s restrictions on the import of recyclables may also lead to increased development of domestic recycling markets, creating more opportunity for our recyclables to be recycled and reused locally.